I am pretty sure your mom is going to agree with me on one thing: sports will play a significant role in your life. The first time you read Geoff Colvin’s “Talent is Overrated”, you are probably going to think about direct applications to your favourite sport. I wonder if it is going to be basketball. Or soccer? Or Kendo? I think baseball is the frontrunner right now… Grandpa Crowe is a season ticket holder for the Tigers. Your aunt and uncle still play softball and your mom used to play little league in the United States. Keep this book and read it again when you start working. It would be silly for me talk to you about the applications of the principles in an organization because right now I picture you as a child. Some of the names the author mentions in the examples will not make much sense to you, but don’t be discouraged if you get lost in the introduction. 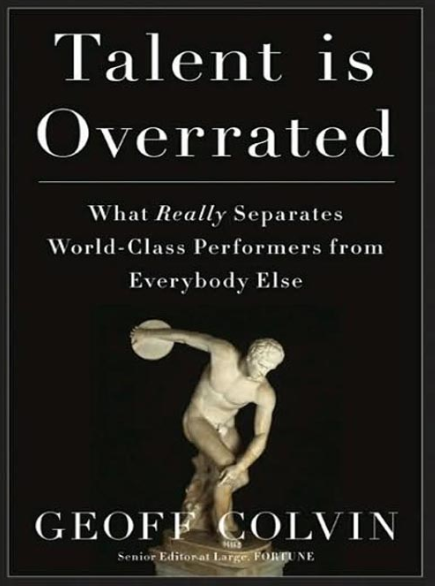 The author is just trying to defend the idea that talent is not a pre requisite to success. The key to become a top performer is practice, but a special kind of practice. Focus on understanding what the author means by deliberate practice. At the same time keep in mind what I am doing right now with my life. You see Ender, we are in this together. I read this book today. We are learning and putting all this to practice together… even if I am not around anymore. I am going to focus on the last one. At first I thought the author meant that it is not easy. Not the case. Deliberate practice is not fun. It brings you out of your comfort zone. Doing what you do well is enjoyable. You need to picture an ultimate goal, figure out the steps to get there. Find out where you can improve and do it over and over again. Like I said, I am going to put this into a bigger perspective. Before I go I want to let you know one thing. You are going to put into practice these lessons a lot sooner in life if you play organized sports. I want you to play sports but in the end you are going to pick your own path. You can do whatever you want. Anything really. Your mom played the violin… up until last year she was in a dance team. She likes to paint. I am going to read before bed. My next post is not going to be on any books. We are going to have a heart to heart… You are doing really well. I am going to tell you something about my childhood dream.